Good accident reporting can help to increase safety at work and this programme is an essential guide, explaining what should be reported and why. It's designed for everyone to use and has been approved by RoSPA and accredited by CPD for your reassurance. Work towards compliance with RIDDOR 2013 with our Accident Reporting Training. This Accident Reporting Training programme is designed for everyone to use. It explains what accident reporting is, why it’s important and what could be included in a report. It ensures that everyone in your workplace knows how to complete a clear and concise accident report if they’re involved in an accident or incident at work. 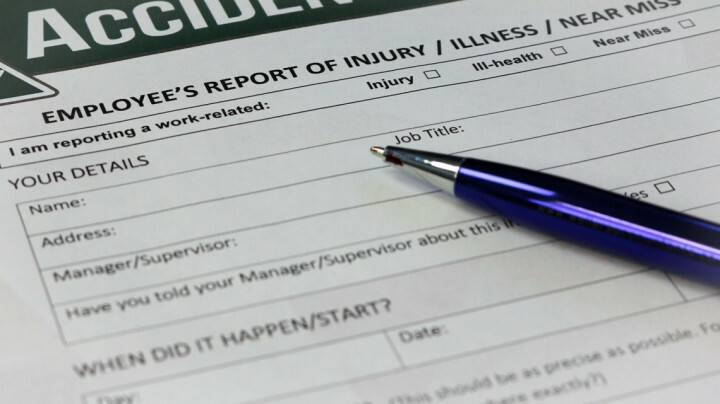 It explains how good accident reporting can increase safety at work and it includes a downloadable Accident Report Form which can be used in your workplace for reporting accidents and incidents. The course is split into three main sections to make it easier to digest and takes roughly between 15 and 20 minutes to complete for your convenience; whilst still covering the essentials of accident reporting. Prevention is always better than cure. Take a look at our Risk Assessment Training, it could prevent a number of accidents from happening in your workplace. The Accident Reporting Training course is broken down into 3 sections. This section looks at the importance of keeping accident records. It includes information about Accident Books and data protection laws. It also explains what RIDDOR is and its relevance to accident reporting. 2) What should be recorded? This short section looks at what MUST be recorded, and what COULD be put in your Accident Book, depending on what level of reporting your organisation uses. This final section is all about completing a report. It explains what information might be needed and suggests things that might be included in the report that you may not have thought about. This Accident Reporting Training course concludes with a 10 question multiple choice test with a printable certificate. In addition, brief in-course questionnaires guide the user through the sections of the training and are designed to reinforce learning and ensure maximum user engagement throughout. Your Accident Reporting Certificate includes your name, company name (if applicable), name of course taken, pass percentage, date of completion, expiry date and stamps of approval or accreditations by recognised authorities. Based on 55 real user reviews. I found this course really easy to understand and learn from. Shame I could not have the sound on at work, may have got 100% instead of 90%! A good course that covers most things you could want to know. Read our full reviews for Accident Reporting Training. Reporting of Injuries, Diseases and Dangerous Occurrences Regulations or RIDDOR (2013) states that employers require "responsible persons" to report accidents, major injuries, dangerous occurrences and even death in the workplace. See a more detailed list here - types of reportable incidents in the workplace. Breaching regulations is a crime and can result in a hefty fine. What is meant by the term 'Work-related'? - The way in which the work was carried out. - The condition of the site or premises where the accident happened. Placeholder image for What are the most common causes of accidents in the workplace? Placeholder image for What Should I Do After an Accident in the Workplace? What Should I Do After an Accident in the Workplace? Placeholder image for Is my Incident Reportable under RIDDOR? Is my Incident Reportable under RIDDOR?